I mentioned a couple weeks ago that we would keep updates on the small crop of Zinfandel we would be helping with and wouldn’t you know it, we got busy and forgot. However, what I can do is let you in on some simple basics about this particular grape varietal. By the way, the crop we will be helping do the crush on is still on the vine – yes, you heard right, our friend ran into some problems with using a particular facility to do the crush and it set him back a couple weeks. Still, although there’s some raisining going on, the winegrower wanted a high octane vintage, and he’s got it now. If you’re not aware, the longer the grape is on the vine, the sugar content will likely go up and in-turn raises the alcohol level. Anyway, back to the dynamic Zinfandel grape. First, if you’re wondering where the name came from – well, no one really knows. Except that it is used primarily in the United States. It’s generally agreed the grape originally came from the region surrounding the Adriatic Sea, such as the countries of Italy and Croatia. However, don’t get into an argument about it because there’s not enough information out there to suggest where the varietal actually first started. You will also here that the grape is genetically the same as Primitivo, which derives from Croatia. Zinfandel, or Zin as fans of the wine call it, was introduced in the United States nearly 200 years ago. In the mid-1800s, the grape arrived in Sonoma and Napa regions of California. Here’s an interesting tidbit: Zin was part of the the first wine boom during the late 1800s and was the most widely grown vine in California. In short, Zinfandel is an American product and essentially a California grape. For reasons that aren’t necessarily clear, but due in part to Prohibition, Great Depression and World War II, wineries closed and the Zinfandel variety did not surface again in any regularity, becoming almost lost in history. While connoisseurs of the varietal look down on it, White Zin brought back the grape from obscurity. White Zin is pink, lower in alcohol and easier to drink, becoming a popular inexpensive alternative. They make White Zinfandel by taking the skins off just after the crush, offering up a lighter wine for the general public to enjoy. 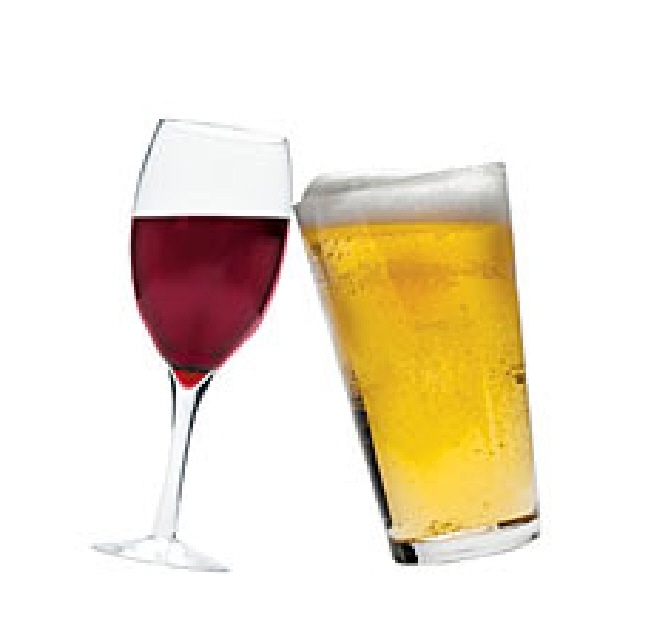 Its said that one in ten bottles of wine sold in the U.S. are White Zin – multiples times more than its red brother. As the wine boom started up in the 1990s, varietals of all sorts became popular including a resurgent Zinfandel. 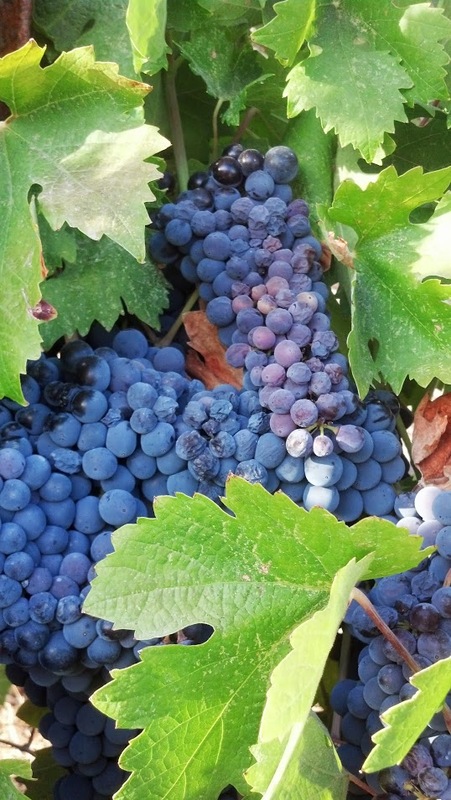 Zin, which is typically picked during normal harvest time (September/October), often is used for port and can be picked later for a late harvest version. Another little tidbit is that vintners often used Petite Syrah to top off or even mix with Zinfandel. Petite Syrah offers an inky color to Zin and makes it appear more full bodied. Only Chardonnay and Cabernet Sauvignon are are more popular than Zin. Red Zinfandels are widely known in the Paso Robles wine region of the California Central Coast. The grape loves the huge temperature diurnal in Paso Robles, or Paso as it’s called locally. Temperatures in Paso can often hit the 100s in the summer but cool off to a cool 50 at night. Paso Roblans are very territorial about their Zin – check out the YouTube video that became a video hit. Zinfandel has a relatively thin skin, which can make it tricky to grow. Known for their higher alcohol levels, not all wine enthusiasts gravitate to Zin. However, fans of Zinfandel are extremely loyal and fervent in their admiration for the wine. Regardless, Zinfandel will always be America’s wine and can be drank with almost any meal, although consider it with a big meaty meal. Zin is a diverse wine that can be made into many assorted types of wines. Just be aware when foreign based Zin’s are sold here in the U.S., they aren’t Zin but likely Primitivo. Again, beware. Remember to look in your stores for great Zinfandels from Sonoma, Napa, Amador (gold country) and of course Paso Robles in the northern region of San Luis Obispo County … Zinfandel, Paso’s wine. This entry was posted in Central Coast, Wine and tagged California Central Coast, Paso Robles, Primitivo, wine country, Zinfandel on October 30, 2013 by PasoDr. A ‘Toast’ – What is it? A successful harvest, a gold medal vintage, a sports victory, a wedding, a special birthday, a successful business venture or New Years Eve: if the occasion presents itself, we honor it with a “toast”. All the times you have made a toast to something, somebody or event, have you ever wondered how clinking glasses to celebrate a special occasion ever got started and why it is called a “toast”? Ancient mythical stories regarding the fear of poisoning and thus spilling or splashing the drink into your host’s glass so you both would be drinking the same mix, seems to have been discounted. Another aged tale is that many old seafarers believed there were demons in the rum they were drinking and it could make you do things you didn’t want to do. They believed the sound of glasses clinking would drive old demon rum out, thus the clinking of glasses. A somewhat substantiated story indicates that back in the 17th century, a spicy flavored piece of toast would be put into each glass or the crystal drinking bowl before dipping glasses prior to honoring a respected person, usually a lady – thus the word toast. The lady in whose honor the drink was proposed would figuratively have given the drink a beautiful flavor. You’ve heard the phrase, ‘toast of the town’? That’s because the toasting was a tribute for those that were accomplished. Another thought was that the sound was a good signal of a fruitful marriage at weddings or a prosperous year for a birthday. Still others say that the lift upwards of the glasses is in reverence to God. 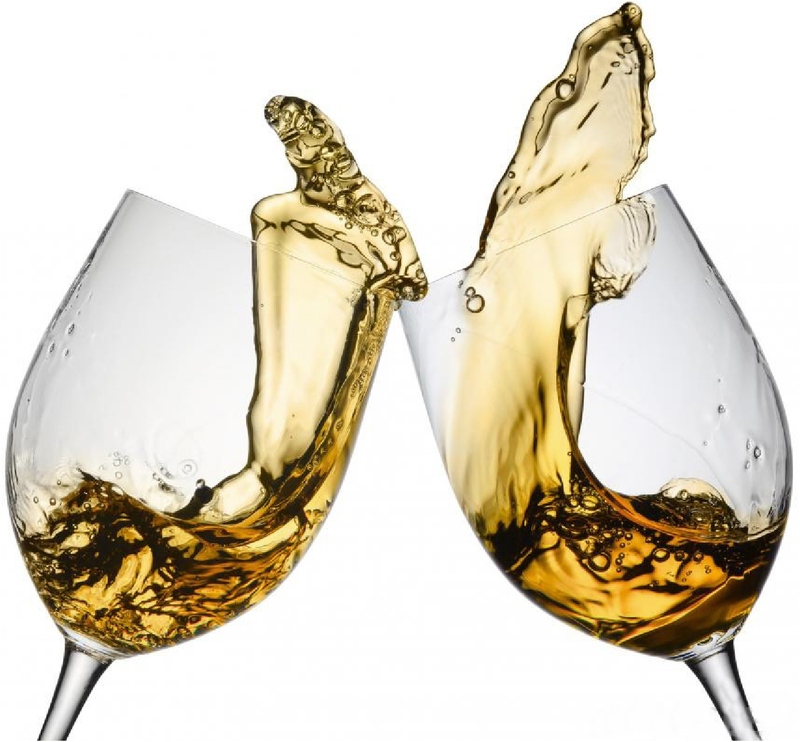 Living in wine country and being associated with the wine business, there are many occasions to offer a toast. We will be gathering the grapes in one week and yes, we look forward to “toasting” a successful harvest. No, there won’t be any poison here, just medal award winning wines as we will clink our glasses to those beautiful grapes, to good health, happiness and a long life. This entry was posted in Uncategorized, Wine and tagged cheers, Salootie Pattotie, toast, wine glasses on October 26, 2013 by PasoDr. At the end of some of our website pages or blog stories, you will see the closure “Salootie Patootie”. What the heck is Salootie Patootie and how did we arrive at it you might say? You might have other ideas as to its origins but we’re here to clear that up. Salootie Patootie is a Beegle-ism. Well, what is a Beegle-ism? A Beegle-ism is a word or phrase originated from a long time close friend of ours Mr. Ray Beegle. Ray and I (Ron) met when stationed at the same fire house while members of the Los Angeles City Fire Department. We fought fires together, dodged bricks and bullets during the Watts Riot, associated with each other’s families and along with another fire department friend, bought an airplane together. We vacationed together and after retirement when I chose to become a part of a wholesale auto parts warehouse business, Ray was right there with his support; always with an uplifting Beegle-ism like “Hey buddy, the colors on those uniforms stick out like a s–t house in the fog”. He had a million of them, some I can’t print but would crack you up laughing. To us, it’s a lot like Aloha and can mean many things. Hello, Goodbye, Cheers, Bottoms up, Down the Hatch or Here’s mud in your eye … you get the idea. The guy was one of a kind. Sadly for all of us, Ray passed away a few years ago but his Beegle-isms will be in our hearts forever. Now you know where it came from. This entry was posted in Uncategorized and tagged LAFD, Ray Beegle, Salootie Patootie on October 25, 2013 by PasoDr. Why do some wine barrels have a red stripe? This might be open to interpretation but here we go. At Paso Wine Barrels, we take in almost any type of full sized used wine barrels to reuse and make into a decorative piece for display or use. However, we noticed that there were barrels that had a definite stripe between the two bilge hoops or bands (see our wine barrel page) that go around the center. We’ve also noticed that some barrels have heavily stained areas around the center, which aren’t easy to get rid of and end up being a part of the original imperfections that each barrels have when we give them new life. Still, the painted ones appeared harder to sand out so we’ve stayed away from them – they’re on our list of future to-do’s. However, back to the question which was: Why do the barrels have a red stripe around them? Although there might be other explanations, there are two most common and simple sets of answers. 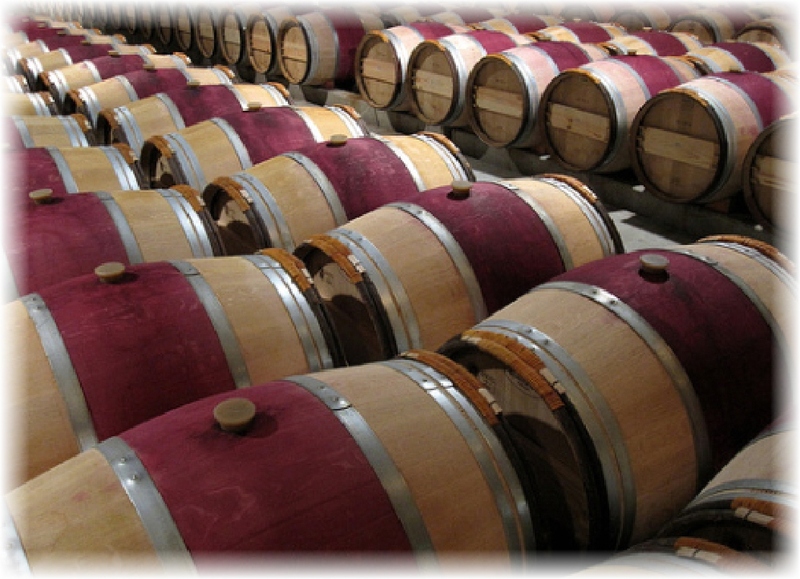 First off, in wineries, to keep the wine sorted between red and white, companies paint the red wine barrels with the red stripe to merely designate red from white wines. The second belief is the barrels are painted red because of aesthetics – and maybe some pride – because the wine is tested by the winemaker occasionally while aging to keep tabs on when the wine is ready. It’s not necessarily a sloppy job but accidents are common. The casks all come from the cooperage as white oak barrels so the accompanying accoutre mon and painting is usually done at the wineries. The red ‘paint’ is usually a mix of red food dye and/or wine like a Petit Verdot, which is frequently used for blending or adding color to other varietals, especially here in California. Some wineries will add to the paint the actual vintage for that particular wine either from the prior year’s crush, and also note wood stain is also used. Still others use beet, pomegranate or other assorted juices that stain easily. Occasionally the question is asked, is it healthy that wine is spilled? Couldn’t that create microbial problems? The simple answer is no. We may talk about this at another time. So, whether the answer is vanity or uniformity, these rationales are the best explanations for why some wine barrels have a red stripe down the middle. 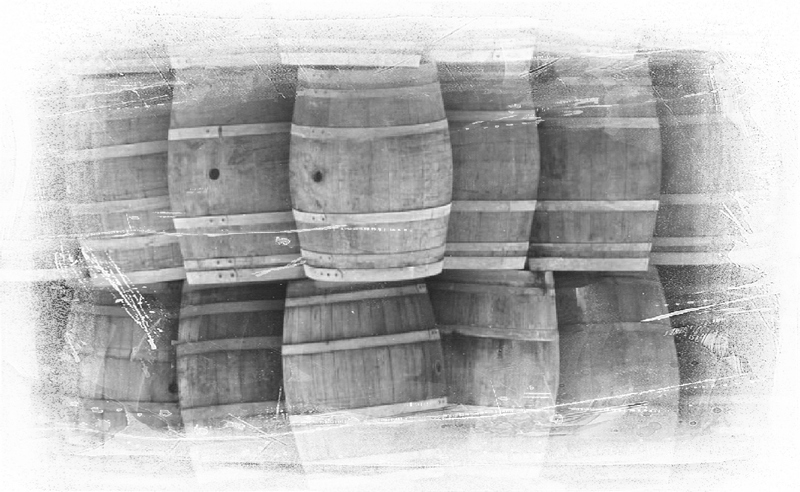 This entry was posted in Barrels +, Wine and tagged red stripe barrel, wine barrels on October 24, 2013 by PasoDr. Each year, we have a special day in Paso Robles called Pioneer Day. You can catch the whole story here: Pioneer Day Paso Robles is Pure Americana. In brief, it’s a celebration from the town to the town, recalling our heritage. A parade, bean feed and many assorted things to see and even be a part of, go on all day. The date for 2013 was Saturday October 12th and the whole thing was free. One of those many special reasons we call Paso Robles home. 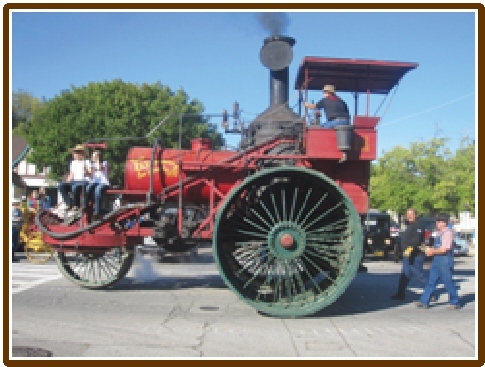 This entry was posted in Central Coast and tagged Americana, Paso Robles, Pioneer Day, tractors on October 23, 2013 by PasoDr. Zinfandel grapes are one of the most common grapes in the North County area of Paso Robles. In the coming weeks, we will be commenting on this particular varietal because we will be helping do a crush of several tons of the beautiful grapes. It loves our weather and arguably is one of the more beautiful berries. Oh, and we love it too. This entry was posted in Wine and tagged Paso Robles California, Wine, wine grapes, Zinfandel on October 22, 2013 by PasoDr. First, you have to understand that our interest in wine barrels came by accident. Not because we were forced into it or didn’t like them or even what their normal function was – like making beautiful wine – it’s just that I guess when you come from the big city (Los Angeles), things like creating decorative wine barrels isn’t at the top of the list. However, as most in this striking area probably understand, it’s a company town of sorts. That’s not necessarily said in a derogatory way; but, the little city of Paso Robles is now mostly a mirror of the region, which has been consumed by the wine industry. So nearly everyone you know here has some connection to wine and/or vines. A very good friend and neighbor has a boutique vineyard in his backyard called Venture Vineyards, representing little more than a quarter acre of multi gold-winning zinfandel grapes. We helped him with all levels of making wine and in the process, interactions with others in the industry brought us to the point of wanting barrels, primarily to make planters. We’d fix them up by sanding, staining and painting the bands. Then we decided one day, while looking at a barrel that we hadn’t cut into yet for planters, what they would look like all spiffed up and placed in the house. We sanded and stained one, plus this time we added some varnish (urethane) to give it a more glossy look like furniture has and … well, WOW, we said. However, it was when others saw the barrels and it became the topic of conversations that we started making them for friends and now, they are available to the public. We probably pour too much labor into them to make the wine barrels just right but that’s our nature. Still, there you have the short story as to how we ended up renovating wine barrels into unique and beautiful pieces of furniture. Also, we’ve listened again to request and now offer wine barrel planters that actually you can utilize for many assorted uses. We also added a cool wine barrel for your garden hose. Keep coming back and checking our blog as we inform you on an assortment of subjects, all pertaining in some way to the world of wine barrels and Paso Robles … or even about us, the Hier family. This entry was posted in Barrels + and tagged California Central Coast, Oak, Paso Robles, wine barrels on October 21, 2013 by PasoDr.